Bambi Kellerman brings her latest show, Never Too Naked, to the Alexander Bar for some Teutonic-boere bedroom stories. Bambi Kellermann is Evita Bezuidenhout’s sister – and that’s where the family ties end. Whereas Tannie Evita is still the most famous white woman in South Africa, Bambi became a grand horizontal of the northern hemisphere and a super-stripper. Never Too Naked features the little boeremeisie from Bethlehem in the Orange Free State, who found herself in Vienna in the late 1950s. Very soon the sweet, conservative, religious virgin made way for a sophisticated, funny and powerful woman who could fight the world with irony, humour and balls. Bambi Kellerman has actually published her autobiography, also titled Never Too Naked. In it, she details how she married a Nazi and became a stripper on Hamburg’s Reeperbahn. The book traces Bambi’s journey from the Free State to Europe, the USA, South America, and back to a democratic South Africa. On the way she meets The Beatles in Hamburg, travels with Hemingway in Spain, rubs shoulders with Marlene Dietrich and Ava Gardner, sups with Paraguay’s dictator General Stroessner, and of course engages with her sister Evita. 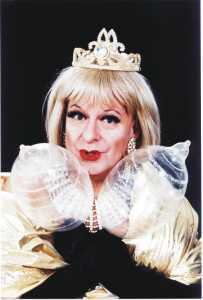 (Pieter-Dirk Uys does not seem to mentioned, funnily enough!) Peopled with showgirls and film stars, Nazi hunters and secret agents, this is an outrageous and hilarious tale. Oh, and Bambi is the one who gives The Beatles their distinctive haircuts, and advises John F. Kennedy when he wants to know how to say: “I am a Berliner”.